Jnana Yajana (January 1, 2011 - January 30, 2011) An eagle’s egg was placed in the nest of prairie chicken, the egg hatched and the little eagle grew thinking it was a prairie chicken. The eagle did what the prairie chicken did. It scratched in the dirt for seeds. It checked and checked. It never flew more than a few feet because that is what the prairie chickens did. One day he saw an eagle lying gracefully and majestically in the open sky. He asked the chickens, “What is that a beautiful bird?” the chicken replied “That is an Eagle. He is an outstanding bird, but you can’t fly like him because you are just a prairie chicken”. So, the eagle never gave it a second thought, believing that to be true. He lived the life a prairie chicken and and died as a prairie chicken, depriving himself of his heritage because of his lack of vision. What a waste! He was born to win but conditioned to lose. The same thing is true for most of us. We don’t achieve excellence and perfection because of our own lack of vision. We are born as human beings, not to weep and wail. We are born to roar, “I’m bliss, bliss, bliss Absolute”. I’m not this body, nor this restless mind, I’m the essence of eternity and I’m the radiant immortal unfading beauty of the soul. This is the zest of Vedanta, Brahman is truth, knowledge, infinite and bliss. You are that (Brahman), says Vedas. This wonderful teaching was simply poured like nectar flowing by most worshipful and Revered H. H. Sri Swami Paramananda Bharatiji Maharaj of Sri Pranav Bharati Foundation Bangalore during entire month of January. In the morning class from 7.00am to 8.00am, he has dealt with “Brahma Sutra Pravesh” and in the evenings he shared the basics of Vedanta. His way of sharing his teachings with his very sincere and prompt effort and to see that pupils are not just sitting ideal, but are seriously grasping the subject wonderfully. He is a born teacher. He dealt the difficult subject of Vedanta like a kind and gentle mother, who love to kindly lit the light of wisdom to the heart of her infants. On Jan 30, 2011 Evening Holy Vedanta Jnana Yajna was concluded in solemn atmosphere. Sri Arun oza vice president and trustee of Sivananda Ashram thanked to Revered Swamiji Maharaj, his organization, and all devotees those who volunteered themselves to attend discourses on Vedanta learning daily during the entire month . Award Ceremony ( Jan 20, 2011) On Jan 20, 2011 evening was special at the ashram. Hundreds of school students from Ahmedabad West arrived for a special event. It was award receiving ceremony.The joy, enthusiasm & vigor were bubbling up on their faces. A diamond jubilee celebration was organized at the Ashram in October & November 2010 in which all together 7500 students from 28 schools of Ahmedabad, West participated in various sports & cultural activities. It was in memory of Revered Gurudev Sri Swami Sivanandaji Maharaj’s Gujarat Divya Yatra in November 1950. Prize and certificates were distributed and award were presented in the worthy presence of Pujya Sri Swami Adhyatmanandaji and Sri Ramdas Gandhi, a leading advocate of Mumbai. Sri Arun Oza and Sri Maulik Shah conducted the entire program. Sri Lalitha Sahshranama Chanting (Jan 23, 2011) On Jan 23, 2011 morning about 350 ladies from Tamil Mahila Samaj, chanted Sri Sri Sri Lalitha Sahasranama in the holy presence of H. H. Sri Swami Paramananda Bharatiji, Sri Swami Adhyatmanandaji, Sri Swami Narayana Swaroopanandaji and others. It filled the the air with divine vibrations and supreme blessedness. 7th Patotsav of Hanuman Mandir at the Ashram ( Jan 26, 2011) On Jan 26, 2011 Flag hoisting was done by Revered Sri Swami Paramananda Bharatiji Maharaj. 7th Pathotsav of Sri Dukhbhanjan Hanuman, Sri Ram durbar, Sri Dattatreya and Sri Jagannath Maha Prabhu is celebrated with full enthusiasm. Maruti Yajna was performed from morning to noon. Concluding was performed by Sri Swami Adhyatmanandaji Maharaj. A great number of Devotees participated in Maruti Yajana. Prasad was offered to devotees after Yajna. Evening was graced by Sunderkand recitation by Sri Ajay Yajnikji Maharaj of Delhi. The holy name of Sri Guru Bhagwan Sri Swami Sivanandaji Maharaj is so great that number of Mahatmas visited and graced Sivananda Ashram Ahmedabad in the month of January namely Mahamandaleshwar 1008 Sri Swami Satyamitranandaji Maharaj from Haridwar, Sri Paramananda Bharatiji, Sri Swami Mangalmoorthiji from Varanasi, Sri Swami Durgeshanandaji from Kolkata, Sri Swami Vedantanandaji from Chidambaram, Sri Swami Vishnudevanandaji from Vidyanath (Himachal Pradesh), Mahanta Sri Swami Shamprakashji Maharaj, Haridwar and Sri Swami Paramananda Saraswatiji from Baroda. Mr. Samuel Klemke from Wimer (Germany) came to attend famous music festival organized by "Saptak" at Ahmedabad. Mr. Samuel met Sri Swamiji at the library of the University of Science and Technology at Wimer, Germany. He is an accomplished guitar player. He joined in Gayatri Yajna and meditation during his stay at the Sivananda Ashram, Ahmedabad. Month was concluded with sweet singing of Lord's glory in Sunderkand by Sri Ashwin Pathakji, a great Bhakta. Large numbers of devotees attended the satsang on January 31st. Revered Sri Swami Adhyatmanandaji Maharaj was gracefully awarded the prestigious Ambassador for peace award by Universal Peace Foundation Federation on January 13, 2011. Function was presided by dignitaries from India and other countries of Europe & UK. Ahmedabad : On Jan 9, 2011 Sri Swami Adhyatmanandaji Maharaj was invited by Women’s Development Cell. Respected Vice Chancellor Dr. Parimal Trivedi and Sri Swamiji Maharaj lit the lamp for daylong seminar. Sri Swamiji, in his inspiring speech stressed on living virtuous life, importance of daily introspection, make prayer and meditation a part of your life, be true to thy own selves, be moderate, speak gentle, sweet & truth. Key to happiness in within you. On Jan 17, 2011 evening "Shraddha Setu" program was organized by leading Gujarati news paper “Divya Bhaskar”. Hundreds of saints came for this wonderful get together from all religions meet. Sri Swami Adhyatmanandaji Maharaj was one of the invitees at this meet. Jan 30, 2011, Punya Tithy day of Father of the Nation, Pujya Bapuji Mahatma Gandhiji was observed with all religion prayer and silent meditation at Gindhi Ashram, Sabarmati, Ahmedabad. Pujya Sri Swami Adhyatmanandaji Maharaj attended prayer meeting with other religious organization head and acharyas. Khedbrahma - Rojanto & Ambaji ( Jan 15, 2011) Satsang of Holy Sri Makarsankrant was organized by blessed ‘Patel Trio” Sri Manubhai, Sri Ramanbhai and Sri Vaktabhai Patel at Rojanto (Khedbrahma). About 300 cows were allowed to graze freely in the ready green crop of fresh corns. Revered Sri Swami Adhyatmanandaji gave a inspiring discourse and prasad (dinner ) was served. Entire program was organized by the Divine Life Society, Khedbrahma. Sri Swamiji Maharaj accompanied with devotees from ashram visited and had darshan of Sri Maa Ambaji at Sri Ambaji also. Jamnagar (Jan 8, 2011) Upon the generous invitation of Zonal President of Lions Club, Jamnagar, Sri Swami Adhyatmanandaji Maharaj visited Jamnagar. His short stay was full of programs here. In the morning Sri Swamiji visited the Agriculture firm of Dr. H. G. Tannaji, met members of Lion club thereafter Swamiji graced and blessed the Eye Camp organized by the Divine Life Society, Jamnagar. 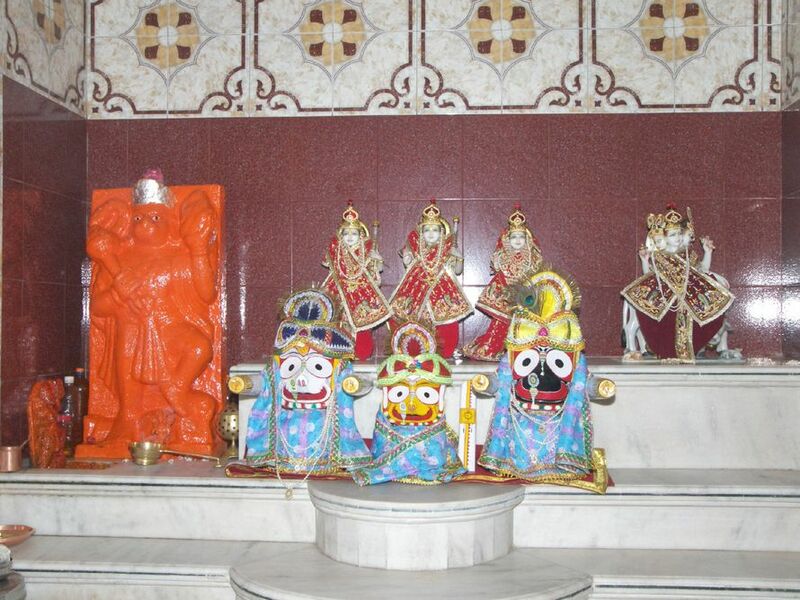 He paid his homage to Sri Kabir Ashram and Sri Anandababa Ashram, Sri Bal Hanuman. In the afternoon Sri Swamiji conducted a prayer meeting at Divine Life society branch, which was attended by large number of devotees. Mid day Sri Swamiji graced holy Sri Gayatri Yajna organized by Dr. Vamanbhai Mankodi. The main function of Lions Zonal Conference was organized at famous farm house. He shared his thoughts on the subject of " Be fearless, Be the Leader". At number of places the Tree Plantation was done by Sri Swamiji. Also, He inspired people for blood donation and tree plantation. At late night Sri Swamiji returned back to Ashram at Ahmedabad. Delhi ( Jan 23, 2011): On the pressing invitation of Sri Sri Sri Ravi Shankarji Maharaj the founder of “The Art of Living”, Sri Swami Adhyatmanandaji Maharaj visited Delhi for a day long meeting jointly organized by Art of Living , Inerela and Asia pacific at India Habitat Centre, New Delhi. The main topic on which the entire day was focused was “Maternal and Child Health and Stigmatized Diseases.” The program was attended by the leading religious leaders from all over the Globe. Mahashivratri Utsav( March 2, 2011 - March 3, 2011) Continuous twenty four hours worship services will be offered for the peace and prosperity of the Mankind at Lord Vishvanath Temple. Satsang and Bhajans starting from evening and continuous through the night by eminent artist & musician. 5.00pm- 5.00am ( March 3, 2011). Mahaprasad for all devotees will be served on March 3rd at 11.00am.